The world eagerly watched on July 20, 1969, as Neil Armstrong and Edwin “Buzz” E. Aldrin, Jr. took mankind’s first steps on the Moon.This unprecedented achievement was the culmination of the efforts of 400,000 Americans and secured our Nation’s leadership in space for generations to come. The Apollo 11 crew returned to Earth 4 days later, fulfilling the national goal set in 1961 by President John F. Kennedy. In recognition of the 50th anniversary of the first manned landing on the Moon, we are offering two of the U.S. Mint’s commemorative coins in an exclusive package. 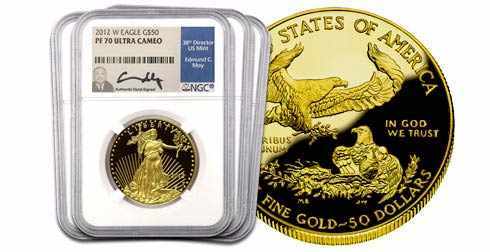 The $5 dollar gold coin is composed of 90 percent gold, six percent silver and the balance copper. 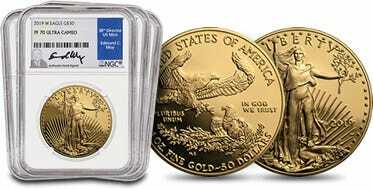 The gold Apollo 11 coin will be limited to a 50,000 mintage across all gold product options. 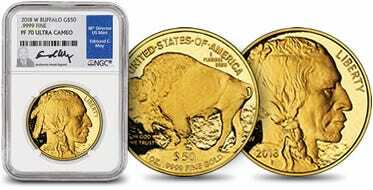 This five-ounce Silver Dollar is the first of its kind- it is the only US coin to be made with a proof finish, reeded edge, and curved shape. And what better way to celebrate the first manned Moon landing which occurred July 20, 1969.